I believe that the belt is modelled on the LI ribbed pattern but with leather-covered buckles and a black metal slider. On the formation of the regiment, every soldier who had previously purchased a belt of one of the four founding regiments (ie all serving soldiers!) was issued a belt free of charge. I met an officer in the new unit "The Rifles" and he was wearing his belt with the buckles in the front. He told me that this was a Light Infantry quiff and that they had always worn them this way. 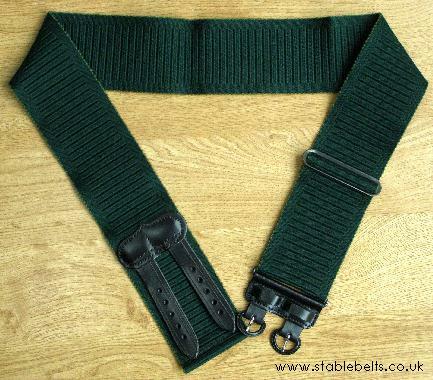 Another former member of the Royal Green Jackets confirmed that they had worn the buckles in front as well.